You are currently browsing the tag archive for the ‘white privilege’ tag. 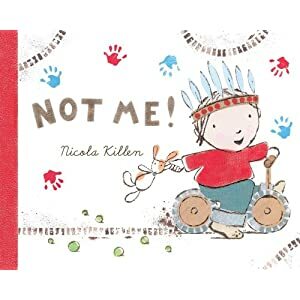 Yesterday my friend Debbie Reese (the scholar behind American Indians in Children’s Literature) blogged about a new picture book, Not Me! written and illustrated by first-time picture book author Nicola Killen. The book was published by Egmont in the UK and is available through both the UK and US Amazon market. Especially as a professor teaching a course on Social Justice and Children’s/YA Literature, I had to see what this was about. Seeing the cover image on the left, I hope it’s clear why Debbie blogged about this, and why I also felt the need to comment. Unfortunately, for some reason Blogger keeps returning an error message when I try to comment on both Ms. Killen’s and Debbie’s blogs, so I’m posting my comments here instead. I have been following this thread with great interest and am very much enjoying the conversations here. I think the fact that Debbie is Nambe Pueblo and an educator with a background in American Indian Studies lends great credibility to her cause. I would hope that me being Korean American and having an academic background (both a BA and MA) in Asian American Studies would lead others to trust my judgment when I comment on similar issues. This is pan-ethnic alliance and strategic essentialism and should not be dismissed as “[presuming] to represent.” Therefore I take offense to the implication that dressing up in a kimono is harmless “play” when that same child might think that likewise dressing up in a grotesquely bucktoothed, squinty-eyed karate costume on Halloween might also be “play.” It’s a slippery slope, and one where I would exercise caution over liberty. Taking liberties in the name of freedom of expression seems culturally arrogant. The suggestion that a Native child wearing a cowboy hat has the same effect of a white child wearing a Native headdress is egregious – this dismisses the centuries of genocide and discrimination suffered by Native Americans at the hands of mostly white people, and elides the power and privilege that white people hold in this country and others. While white people doing blackface is not exactly the same, I don’t think the connection is without merit. It stems from not understanding and respecting different cultures, and reducing them to entertainment and even mockery. And at the end of the day, as Debbie notes, if Native students are not doing as well as they could in school, partly because of the ways in which they are misrepresented and their culture is so liberally used as “play,” well then, does that not give one pause? I would hope that we would extend to those groups the same respect for human dignity that we want and expect for ourselves. And finally, suggesting that Debbie has other places where she could channel her energy is absurd; Debbie is one of the most productive, hard working, and responsive people I know. Her work is incredibly important and has been cited by countless students and professors, organizations, libraries, museums, and who knows exactly how many blogs. She is well respected in the field of children’s literature, and her work has tremendous implications for the publishing industry, libraries, schools, and of course the universities and programs that prepare students to work in those institutions. Her ongoing engagement with Ms. Killen is one example of this tireless work. I also very much respect Ms. Killen for being willing to engage with Debbie and others on this topic. If only others would likewise listen.